After a wet and windy winter it really makes you appreciate having somewhere under protection like a polytunnel or greenhouse. Last autumn, after the tomatoes were pulled out of the cold greenhouse, I dug over the soil and sowed some salad leaves for spring use. Sown in November, the seeds germinated slowly but surely and there were a few leaves to pick by Christmas but it is now that they are really providing tasty leaves. Above is mustard greens ‘Southern Giant’ the seeds of which I got from Baker Creek Heirloom Seeds. 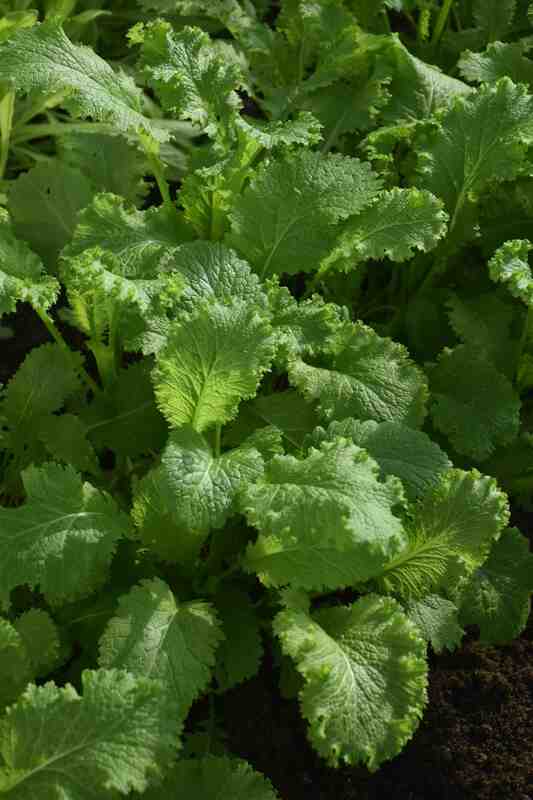 It is an old heirloom from the south (USA) and like other mustard greens it can be used raw or cooked and has a spicy (hot) taste, especially when the leaves get large and the weather heats up. But now it is mild at first though I would not like to eat a salad with just these leaves. What I do like is the lovely frilly leaves and the fact that it has grown more strongly than most of the other plants. Like the other salad leaves they will probably continue to crop for another month or so and the beds will be dug over again to plant the tomatoes in late April. I won’t go on about the ease of growth of these salad leaves or their nutritional value – they are all good for you! From a new plant I had not tried before to a salad that is barely known but that I first ate decades ago. Commonly called spring beauty and more properly Claytonia perfoliata (or Montia perfoliata) this is an annual that thrives in cool weather and usually germinates in autumn and overwinters as small plants and then bursts into growth, flowers, seeds and dies in late spring. My only problem with this is the small seeds which can make sowing direct in the soil a minor issue. But the rewards are great. 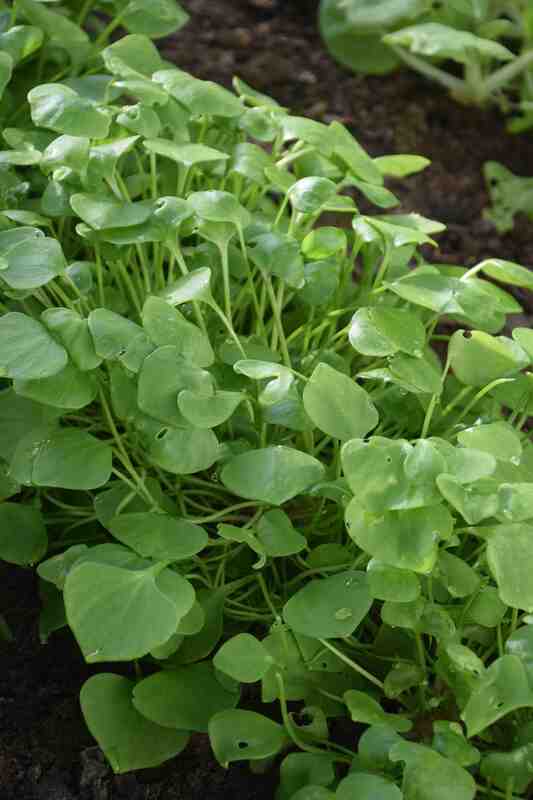 The seed leaves are small and narrow but soon the spoon shaped leaves appear and the plants form a cushion of pretty leaves that are soft and succulent. In time the flowers appear and these are small and white with five petals and appear on stems surrounded by a rounded leaf (perfoliate). It is also called miner’s lettuce and it is native to the NW USA and was eaten by the 49ers as a salad and may have helped to prevent scurvy since the leaves are rich in minerals and especially vitamin C.
When I first met it it was growing as a weed on a bank that I passed on the way to school and I used to pick a few leaves to munch. They are very mellow and have a faint pea pod taste, rather like chickweed. I would say that they are among the nicest of salad leaves (and I am one of those people that likes their healthy salad leaves covered in dressing). Judging by the way that the plants give up the ghost in summer I think this is for autumn or early spring sowing only but maybe, in a moist growing bag, it may provide a summer crop too. When the plants come into flower you can still crop it and eat the tiny white flowers as well. Another new one is ‘Senposai’ which is a Japanese hybrid of komatsuna and cabbage that is bred to create a heat tolerant, fast growing plant that can be used as a salad when young and to stir fry when larger. 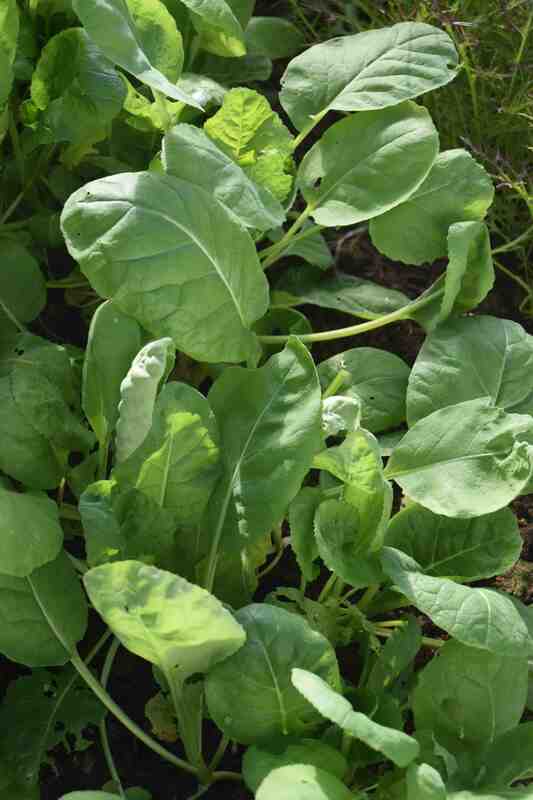 It is very easy to grow and was ready to pick very quickly and the large leaves are soft and mild in taste – perfect to add interest and not too much fire, to a salad. I have mentioned namenia before and I make no apology for giving it a plug again! 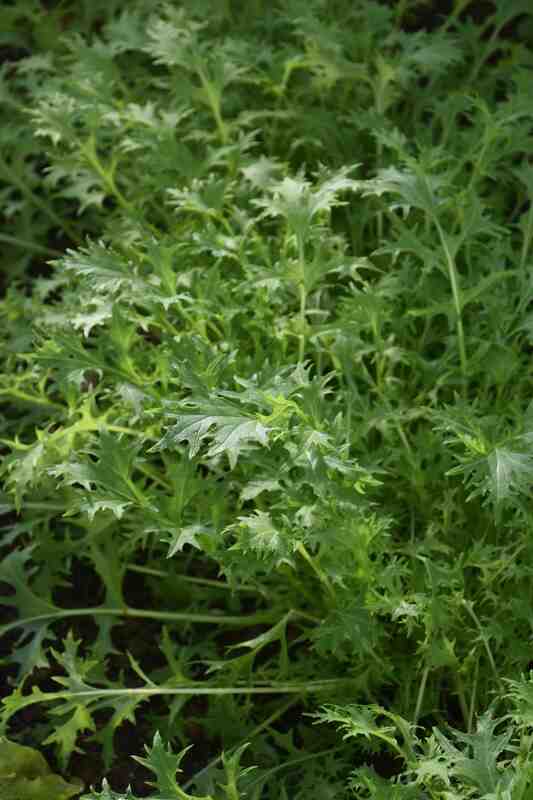 This is such an easy and productive plant and the attractively ragged leaves are mild, crisp and crunchy. I keep meaning to thin them out so they can reach maturity when they would make a big rosette of leaves that would be perfect for stirfries but they are so useful for shearing off for salads that I never get round to that. These greens are all green so far but ‘Ruby Streaks’ is a purple tinted mustard that adds colour and some bite to salads. This can be sown at any time and is very fast and productive. I think this is a old Japanese variety (or descended from one) and, like all mustards, has important cancer-fighting chemicals. It can be used at almost any stage, as a microgreen, a salad leaf and when it is fairly mature when the flower buds can be eaten (Sunny the canary loves them). 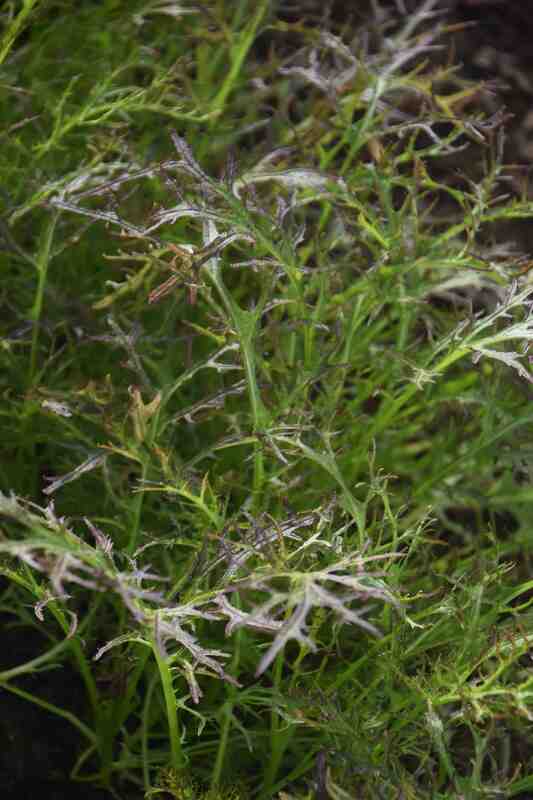 And lastly Mizuna which, frankly, is very similar to namenia. Mizuna is a highly developed Brassica napa (turnip) and namenia, as far as I can find out, is also a Brassica napa so maybe they are as closely related as my sceptical mind suggests. 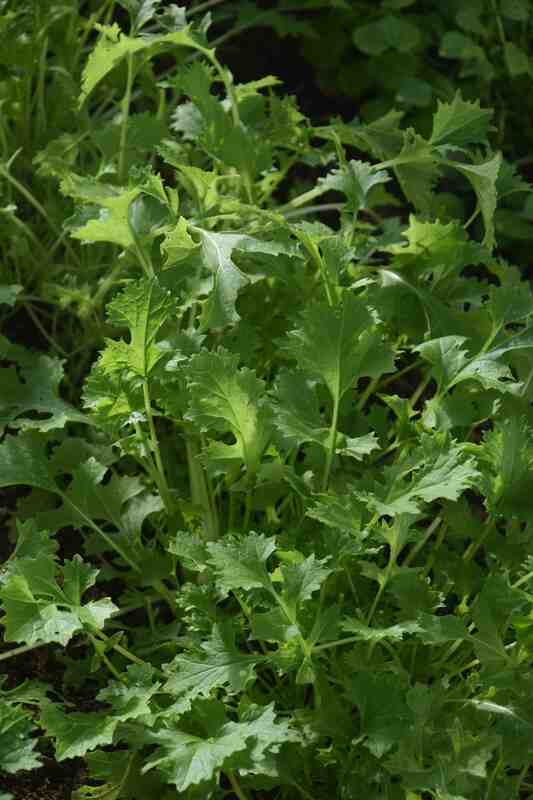 Anyway, mizuna has rather more fine leaves and a similar mild taste and is just as versatile. Both vegetables are cut as a whole leaf and you eat a lot of stem but that adds to the crunch and, presumably, fibre. In addition, I have pea shoots, lettuce and spinach growing from the same sowings. Pass the Caesar salad dressing please!